South Bend, Indiana – Patent lawyers for Plaintiff Swagway, LLC of South Bend, Indiana sued Defendants Hangzhou Chic Intelligent Technology Co., Ltd. (“Chic”) of Hangzhou, People’s Republic of China, Jansco Marketing, Inc. of Pembroke, Massachusetts and COKeM International, Ltd. of Shakopee, Minnesota. Swagway and Chic both sell self-balancing two-wheeled boards, also known as “hoverboards,” in the U.S. market. The two companies had an intellectual property dispute, with Chic alleging that Swagway infringed two of its patents. This dispute allegedly included letters sent by Chic that appeared to threaten Swagway’s business partners with litigation if they sold Swagway products that Chic alleged were infringing. Swagway also contends that Chic delayed Swagway’s goods by falsely alleging infringement to Chinese customs officials. It also states that Chic later issued a press release falsely stating that Swagway’s goods had been seized as infringing. When the dispute persisted, Chic sued Swagway in the Northern District of California on allegations that Swagway had infringed U.S. Patent No. 9,376,155 and U.S. Design Patent No. D737,723. Swagway responded in part by filing a second federal lawsuit in the Northern District of Indiana. In its Indiana complaint, it accuses Chic and its agents, including Jansco and COKeM, of having made “numerous false and misleading statements” to Swagway’s retailers and customers regarding Swagway, its hoverboards, as well as the patent rights that Chic alleged in the California litigation. 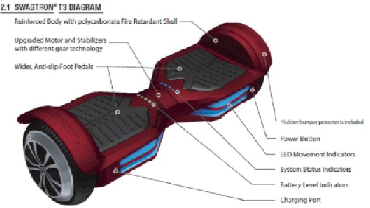 Plaintiff contends that “Defendants made these statements for the sole purpose of causing harm to Swagway’s business and preventing fair competition.” Swagway also contends that Chic withheld material information from the U.S. Patent and Trademark Office and that, consequently, the registration of several patents was improper. Plaintiff has requested damages of no less than $30 million and also includes a prayer for punitive damages. Plaintiff further seeks equitable relief as well as reimbursement of costs and attorneys’ fees.